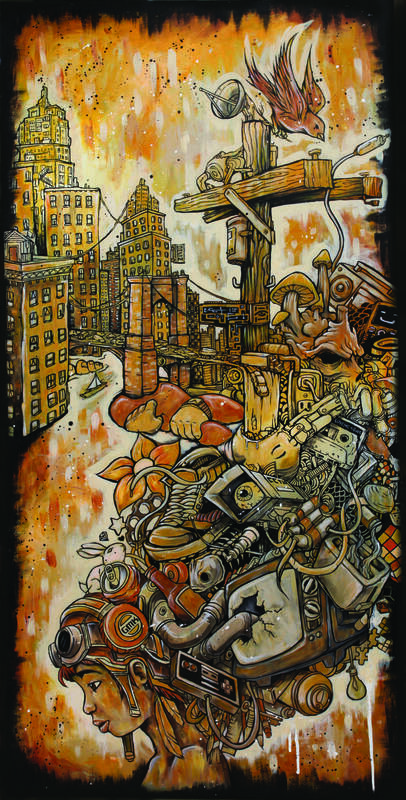 GMONIK’s solo exhibit Trash Metropolis opens Saturday, March 8, at Thumbprint Gallery in La Jolla and runs through April 6. The exhibit will be free to the public and open to all ages. Q. First off, is there meaning behind the name GMONIK? A. Not really. I wanted a name that no other artist had so I created GMONIK (all capitalized) to ensure that there would be no confusions with other artists. Q. From your bio on your website I read that you recently came back to U.S. from living abroad, came back with being “preoccupied by the idea of planned obsolescence” how big of an influence or impact has this been towards your art? A. I lived in Shanghai, China, for three years and traveled around southeast Asia. Traveling allowed me to see the contradictions of living with excess when so many people live without. This has given me a chance to look at the bigger picture of life and not focus so much on my own consumerism. This has affected my art because it has forced me to be more conscious about why I want things and evaluate my needs versus my wants, something I try to capture with my art. Q. I’m sure you saw a lot of different sceneries while traveling and some may have had been more unforgettable than others. What would you say was one breathtaking scene that you witnessed while being abroad? A. One thing I thoroughly enjoyed was witnessing the different nature areas of southeast Asia. During my travels, I swam with baby elephants, played with monkeys, pet a tiger and lion cub, held a crocodile, fed honey to a black bear, and even had a hawk perch on my arm. It just wowed me how I could be this close to exotic animals. It made me think about how the animals are now dependent on their captivity. I use these experiences in my art by incorporating themes of the natural world versus the manufactured world – It’s all about the balance between the two worlds. Q. What would you say your motivation for traveling abroad and living outside the US was? A. My motivation was an urge for a change of scenery and a journey to find myself and my place in the world. Sometimes when you’re too comfortable, you have to change your situation in order to know if the path you’re taking is where you want to end up. I see my art as a part of my journey and evolution. Q. What’s your process like when it comes to creating and executing the work of art? A. Everything starts with a sketch. I like to have my ideas worked out on a page before I put it onto a canvas. This helps to fine tune my imagery in my works. A. Music would have to be my important artist tool. It helps to inspire me when I’m in a creative rut. I like to sing while I work – it helps me stay in a positive mindset when I’m working. Q. Has your practice evolved/changes over time? A. Yes. When I first started out in my artist career, I made things for what I thought people wanted to buy. Now I try to create art that has more meaning, which is makes it more satisfying to me, creatively. Q. How do you decide on a subject matter or concept? A. I spend a lot of time drawing in my sketchbook, which allows for a variety of concepts and designs (some that eventually become public, and some that remain private). Q. Do you recall the first moment in which you realized you wanted to be an artist? A. I’ve always had art in my live. My father worked at a company that manufactured pens and markers and would bring home all the art supplies I needed. My parents used drawing and coloring as a way to make sure I stayed out of trouble. So, drawing eventually became a way for me to express myself and to escape and use my imagination to create the different worlds and characters swimming in my mind. Q. Why art? What got you interested in creating? A. It’s my own idea and thoughts. Art is a way for me to create something to present to the world and the world can see my unique perspective. Q. What do your inspirations consist off or do you have one main source of inspiration? A. 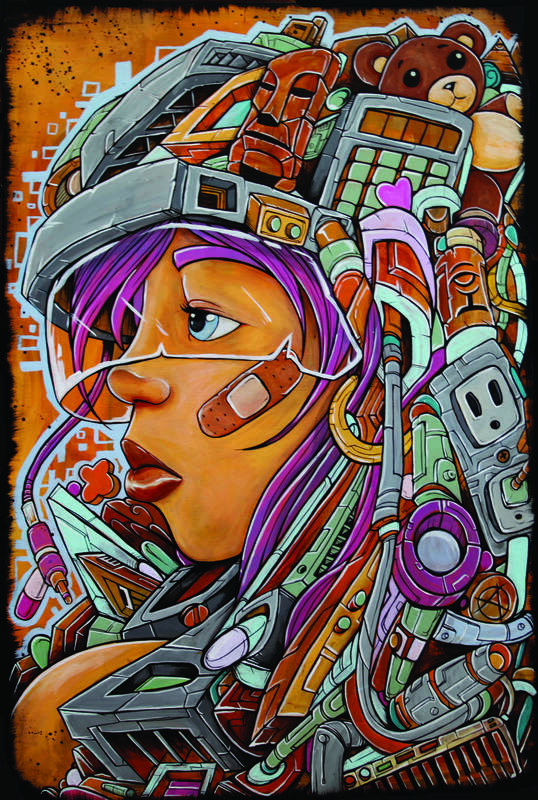 Life is one of my biggest inpirations, as well as street art culture and the power that it all has to inspire people. Q. Is there something that you have always tried to communicate through your art? A. I want to create an emotion – the viewer can have a multitude of experiences when viewing my work. Some people will hate it, some will love it, some people won’t understand, but the most important thing is that my art will create a dialogue. Q. Which creative medium would you love to pursue but haven’t yet? A. I’m starting to dabble a little bit in sculpture and creating more of an experience with my art. It shouldn’t just be something that you look at, but rather, art should be something that you can interact with. Q. What’s your favorite thing you’ve ever created? A. I don’t know, I haven’t created it yet. I’m constantly reevaluating what I like and what I don’t like, so as I grow so does my art. This is what motivates me and keeps me interested in being an artist – I still haven’t discovered my full potential. The journey is the fun part. Q. What are you aspiring to do in the future? Any new projects? A. I would like to work on more video media, as well as mural projects. I like the idea of making large scale art that is easily accessible for all to see. The colorful piece below (top) is entitled “The Unknown” and is mixed media painted on 24″x36″ wood panel. Previous Previous post: He’s Dead! Thank “god” for That!! Next Next post: Meeting Slipknot in San Diego. Not really.